3 Your Heart Your heart pumps blood all over your body. Your heart is a muscle. Your heart keeps you alive. 4 Exercise You need to exercise to stay fit. You need to stretch before you exercise. My favorite exercise is riding my bike. 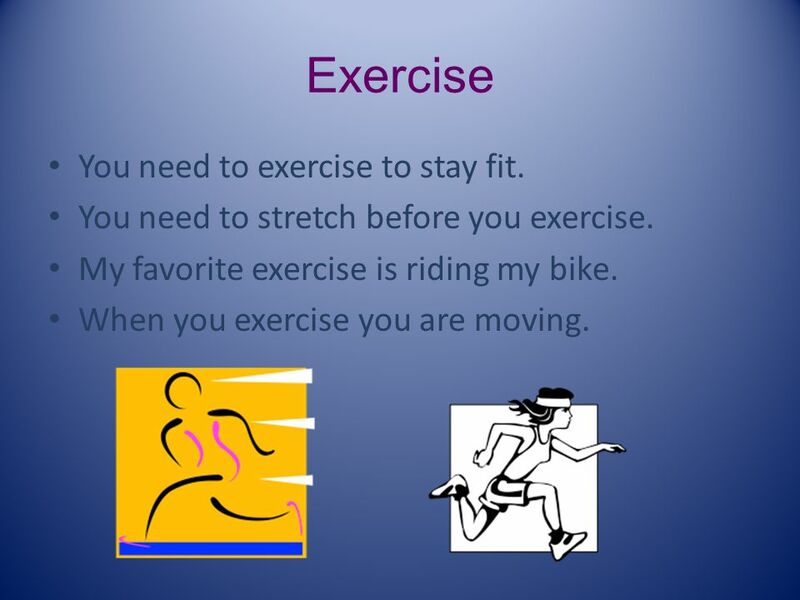 When you exercise you are moving. 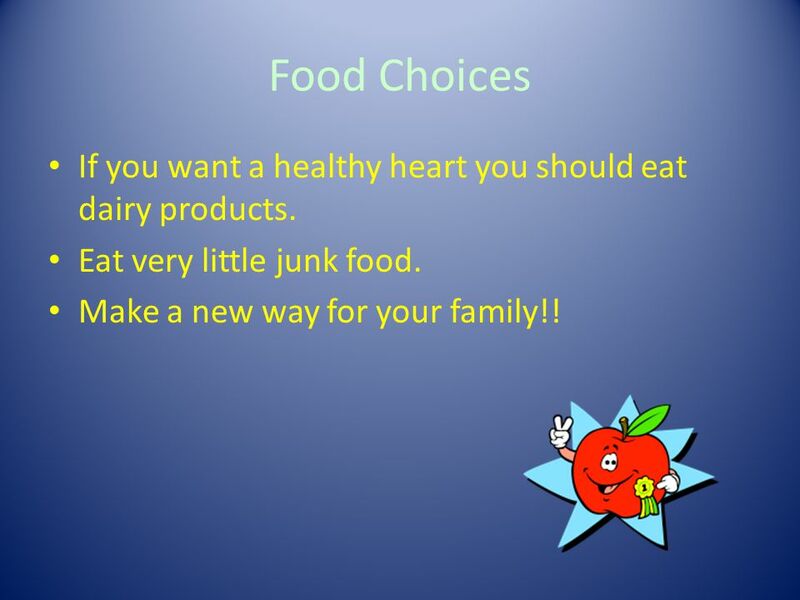 5 Food Choices If you want a healthy heart you should eat dairy products. Eat very little junk food. Make a new way for your family!! 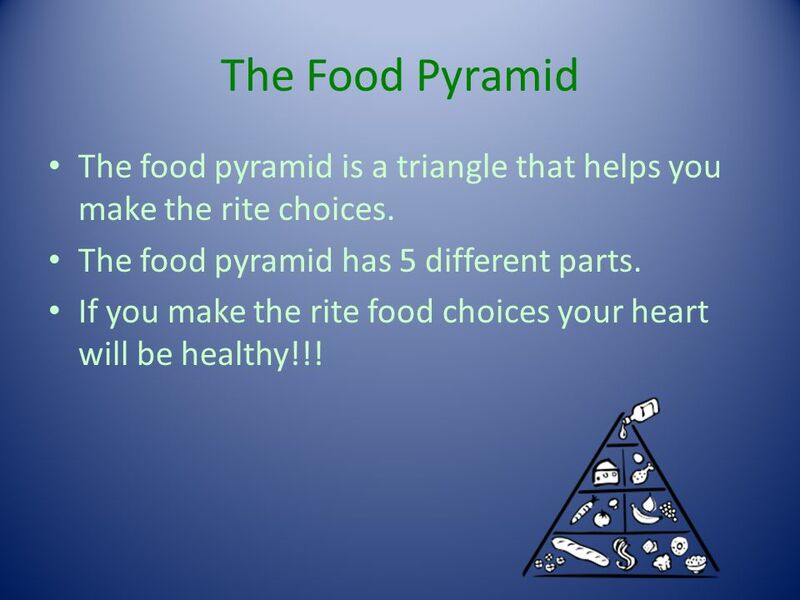 6 The Food Pyramid The food pyramid is a triangle that helps you make the rite choices. The food pyramid has 5 different parts. If you make the rite food choices your heart will be healthy!!! 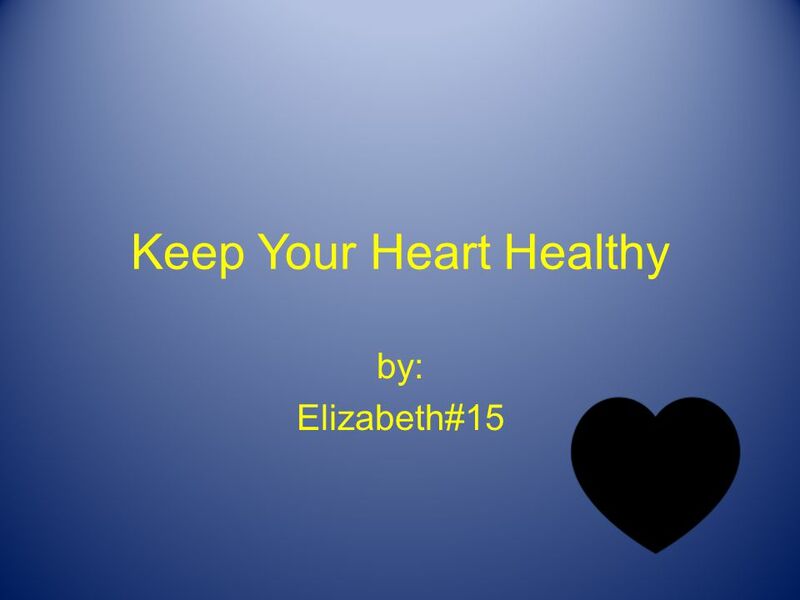 Download ppt "Keep Your Heart Healthy by: Elizabeth#15 Your Heart Your heart pumps blood all over your body. Your heart is a muscle. Your heart keeps you alive." Keeping My Heart Health. Keeping My Heart Healthy You will gather information on keeping your Heart healthy on the next slides. Be certain to read all. The Muscular System By: Nicholas & Nathan. Cardiovascular System By:Abigail, Gregory, and Alex. Healthy choices SEN Knowing and Growing. What is a healthy choice? A healthy choice is something that is good for us. By Henry Wilms Eating healthy is very important for everyone. If you don’t eat healthy, you might get very sick. Eat healthy so you can have strong muscles. B EING H EALTHY Zora’s Digital Story. B EING HEALTHY IS VERY IMPORTANT TO YOUR LIFE. M ANY PEOPLE DON ’ T REALIZE WHY IT AFFECTS YOUR LIFE, BUT I’ VE. 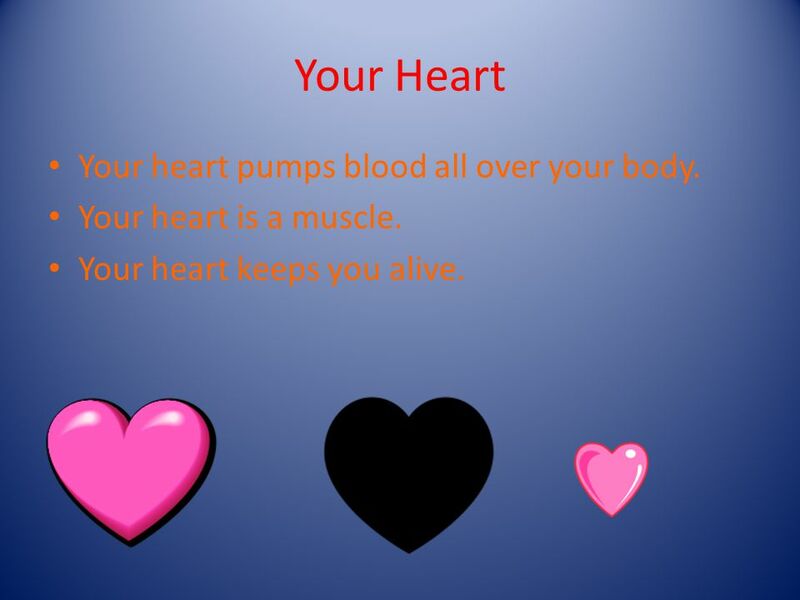 How To Have A Healthy HEART By: Owen#18 Your Heart My heart keeps me alive. My heart is a muscle. I love my heart because it helps me breath. Lesson 3: Nutrition PE Without Boundaries v1.0 4/29/20151. My Muscular System My muscles move my body like strings move a puppet. 1 5/10/ MUSCLES 4 Before you start any activity, what should you do first?? November.22,2007 BY SAMANTHA. The Muscular System. Let’s Make Good Food Choices Objective To teach pre-school children how to make good food choices. March 30, 2006. How To Keep My Heart Healthy By: Alyssa M y heart It gives me a long life. My heart keeps me alive. My heart pumps my blood. My heart is a muscle. Muscular System MOVE YOUR BODY!. Circulatory System Trivia. Question #1 Worth 1 point. Protein is not just a nutrient that the body needs to function normally. It is THE nutrient that the body needs to function in a normal, healthy way.